Our projected travel time back to Punta Arenas from Puerto Williams is 43 hours. But, before we set out, we have one last stop to make. Ernesto has arranged for us a private tour of the Museo Antropológico Martin Gusinde with the museum’s director, another one of his friends, naturally. I toured the museum once about 10 years ago, but no one else on the trip has visited it before. The museum has a two-fold focus, documenting the culture of the Yaghan people and presenting the history of European exploration in the region. It is a well-maintained museum and quite the tourist attraction despite all the exhibits being presented solely in Spanish. The namesake of the museum, Martin Gusinde, was an Austrian priest who lived for extended periods with the Yahgan and documented their social and spiritual life in the early 1930s through photography and ethnography. It is a surprising little museum with well curated and exhaustive exhibits. I am glad to get the refresher course in both of the museum’s foci. The engines start up again at 6 a.m. and quite soon we arrive at Caleta Piedras on Isla Pictón. 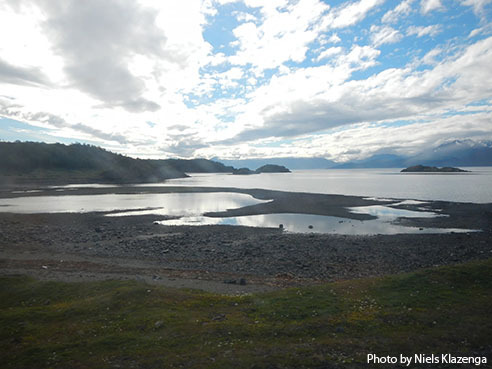 We knew ahead of time that today would be an early day of collecting because we need to also get back to Puerto Williams to gather up the specimens we left behind there. What we didn’t know was that there would be a substantial metal dock at this site, and a house flying the Chilean flag, too. The house is empty now, but presumably occupied seasonally. This morning I am not alone in rising early. 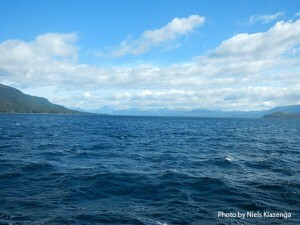 Today is our only opportunity to go into the field on Isla Lennox. It is so warm and sunny that it is hard to decide on an appropriate outfit, one that is not too heavy and yet still waterproof when sitting on the ground. The plan is to spread out so as to cover as much of this substantial island as possible, all the while avoiding landmines. Laura and I decide to work our way along what appears to be a river, but is indicated as an inlet of the sea on our map. The tannic water flowing down into the sea seems to indicate that it is at the very least brackish. It is not rich in moss flora, at least where I am, but I do find a few species of Ulota. Last year one of our traveling companions was Ricardo Garilleti, who is working on this genus in southern South America. Not only is Ricardo a great traveling companion, but he taught me how to be a better collector of this most frequently-encountered genus of epiphytes in this region. Without his knowledge I never would have guessed that different species of Ulota prefer different substrate, especially in terms of Berberis versus Nothofagus. At 3:30 a.m. I hear the engine shut down, so I venture out onto the deck to see if we have arrived at our destination after taking the long way around. 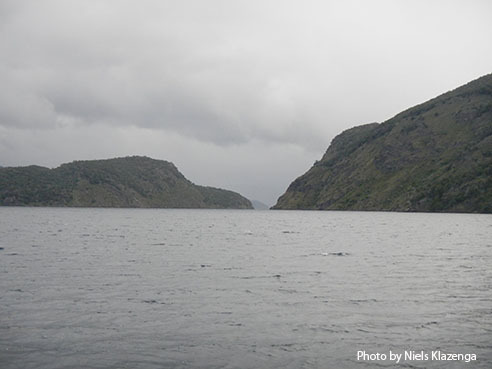 And in fact, we have arrived at Isla Pictón, the northernmost island of the grouping of Pictón, Lennox, and Nueva islands, and the last of our targeted areas for this year. 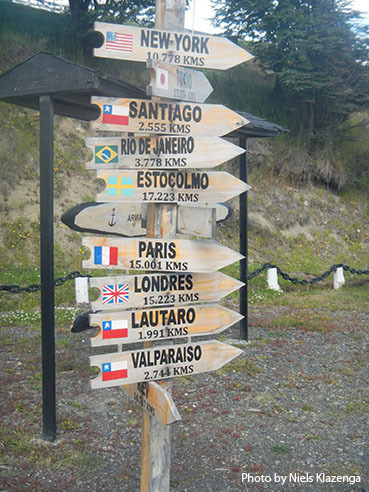 Each of these islands still houses a naval outpost, left from a time in the 1970s when Chile anticipated Argentina would invade them. 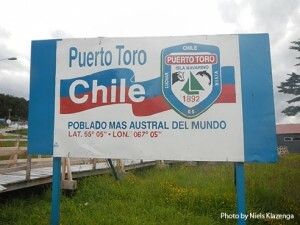 To this day, Juan feels pride in the fact that Chile defended these three islands and still holds them. On the downside, Chile also land-mined parts of the islands as part of their defense. This accounts at least in part for all the security and the hassles to get permission to visit them. The ship begins moving in the early morning hours and the potentially rough seas never really materialize. I think for most of us it is instead like being rocked in a cradle. When we stop we are halfway up the north side of Seno Grandi. 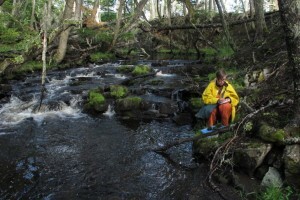 Our collecting site is along a large river that empties into a lake. About half of us go up the east side of the river, and the rest to the west. Although not cold or raining, a steady strong wind makes the Zodiac trip ashore wet and rough. 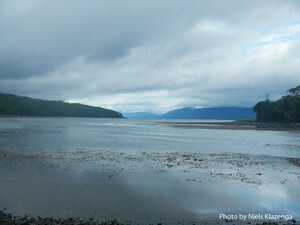 As we approach the shore we can see quite clearly that the landscape is heavily disturbed. There are remnants of abandoned dwellings and piles of crab traps. 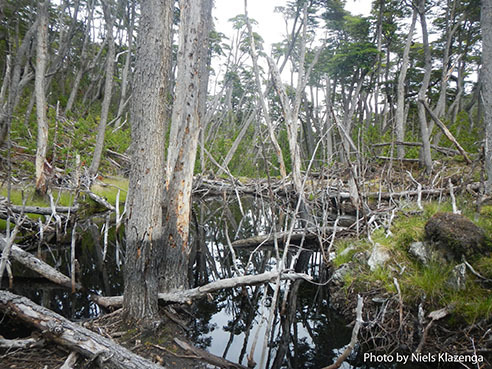 It appears that beaver have caused significant damage to the landscape as well, and that the large peatland to the west of the river is courtesy of an ancient beaver dam. We leave Puerto Inútil about 7 a.m. and arrive at Wulaia a half-hour later. This is one of the most famous sites in the region and one I have visited several times. 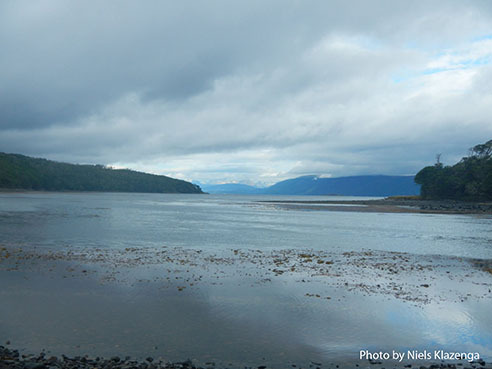 Charles Darwin arrived here on January 23, 1833, 180 years ago–minus one day–today. The site has changed considerably since my last visit. There is now a metal dock for unloading cruise ship passengers, and a large, old slaughterhouse has been transformed into a museum which is open when cruise ships arrive. 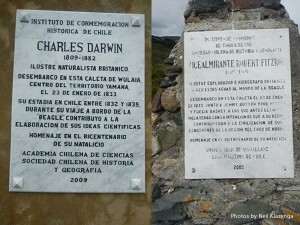 A plaque celebrating Darwin was put up in 2009 on the occasion of the 200th anniversary of his birth. 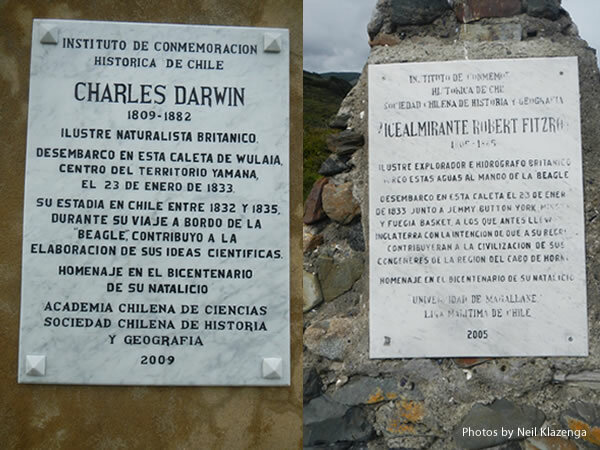 There is also a plaque commemorating Robert FitzRoy, the captain of the HMS Beagle and a pioneering scientist in his own right. In a nice change from the norm, we manage to leave the field station on time this morning. But that doesn’t mean we leave the harbor straight away. We load our gear back onto the trusty Don José Miguel and essentially move back in and then we do a little last minute grocery shopping. 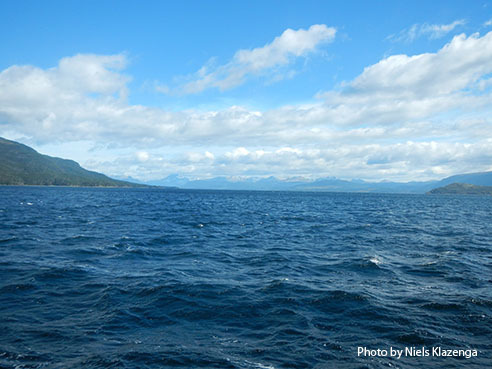 As we enter the Beagle Channel I am surprised by the rough seas. I look to the skies, which don’t look particularly threatening, and decide to blame the turbulence on our running perpendicular to the waves, rather than parallel. But, even when we turn west, into the wind, the choppiness continues. That said, it cannot delay lunch. 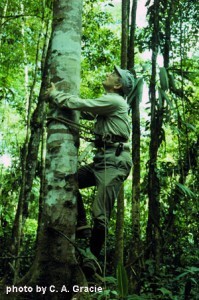 Scott A. Mori has been studying New World rain forests for The New York Botanical Garden for over 35 years. He has witnessed an unrelenting reduction in the extent of the tropical forests he studies and as a result is dedicated to teaching others about this species rich ecosystem. His most recent book is Tropical Plant Collecting: From the Field to the Internet. The author climbing a small tree with French climbing spikes. One of the most beautiful arboreal observations I have made during my long career occurred during an ascent into a large tree, one that happened to be adjacent to a legume tree scientifically named Hymenaea courbaril–more commonly known as the stinky toe tree. It was given this repugnant name because of the similarity of its fruits to a malodorous human toe. While botanical literature had already reported at the time that this species relied on bats for pollination, I wanted to confirm this observation by climbing a nearby tree from which I could see into the canopy as night fell, just as nocturnal animals started to make their appearances. I was especially eager to make this climb because one of my research focuses has been the interactions between bats and the plants pollinated and dispersed by them. This was a rare opportunity to observe the crown of this 115-foot-tall tree in full flower, and as my job was to document the species that occur in the lowland forests of central French Guiana, as well as to discover the interactions that the local plants have with animals, I could not pass it up. 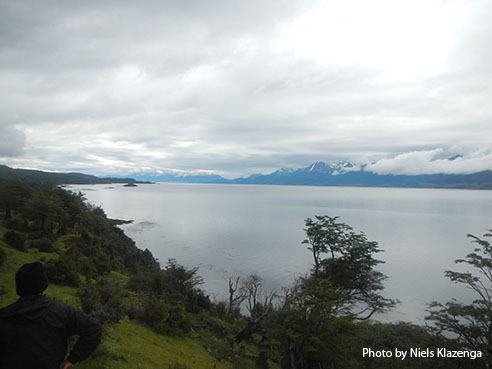 This is our last day on the north shore of Isla Navarino. The weather forecast bodes well for an ascent of Pico de la Bandera. As predicted, we get a slow start to the morning. Blanka and Laura are driven out to Puente La Cascada to see if they can find more interesting hepatics where they found the Lethocolea. Ernesto then heads to his 8:30 appointment with the naval commander to see about getting us permission to access the three islands east of Navarino; Pictón, Nueva, and Lennox islands. He then returns to pick up Blanka and Laura who have indeed found several additional interesting liverworts. Next, a stop to retrieve some laundry, then a stop to pick up lunches from a local store, and then finally we reach the trailhead for the ascent of Pico de la Bandera around 11:30 a.m. The day breaks overcast and drizzly which is a sort of relief; at least now I know that some alien climate has not taken residence in Patagonia! Today is the first day we have to fix our own breakfast, which leads to a late start and only an hour and a half to collect at our first site, which, according to last night’s plan will be on the north shore highway. We now have to hope that tomorrow will prove better for ascending Pico de la Bandera. It is raining only lightly when we head out, but soon the skies open and we drive through a steady rain all morning. Our first site is Vuelta de Perro, about 18 kilometers east of town. It is a very wet site with lots of downed logs. I had been here about 10 years ago and thought it would be a good place to take the group. Since I have been here before and collected extensively, I focus only on the small things, finding lichenicolous fungi and even a couple of fungi over bryophytes, all the while keeping an eye out for interesting mosses. The site proves a little disappointing when compared to our previous pristine sites. It has been heavily disturbed by tree cutting and grazing cattle. Plus, it’s our first day out in the rain.